Yesterday the Arab Health exhibition came to a close after four intense days, and today we bade farewell to Dubai, the “City of Gold” that has become an important business hub. Known for its modern architecture and skyscrapers, including the iconic Burj Al Arab (seen at right), Dubai is now the permanent home to one of the world’s largest gatherings of healthcare and trade professionals, second only to Medica. CapeRay joined over 4,000 other medical companies emanating from 70 countries. We were part of the South African pavilion – one of 38 countries with a dedicated pavilion – and exhibiting a diverse range of products. There were 19 companies supported by our country’s Department of Trade & Industry (DTI), with the organization undertaken by the Medical Device Manufacturers of South Africa (MDMSA). After setting up our exhibits on Sunday afternoon, we met with the DTI’s economic consul and trade marketing officer, both based in Dubai, who provided us with advice on doing business in the Middle East. 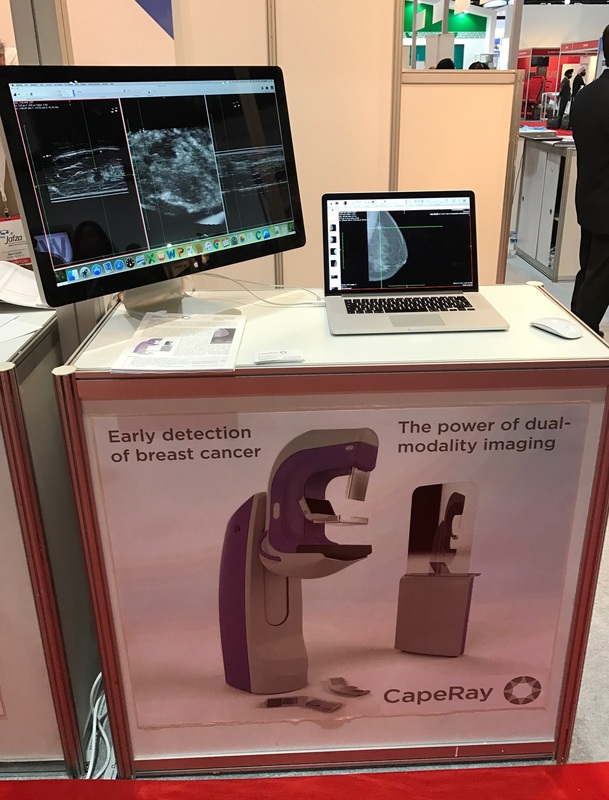 At CapeRay’s stand, CEO Kit Vaughan set up his MacBook Pro and Apple Thunderbolt screen (see photo below right) to illustrate two clinical cases: a woman with a fluid-filled cyst that was benign; and another patient who had been diagnosed with an invasive ductal carcinoma. The power of our dual-modality Aceso system, enabling full-field digital mammography (FFDM) and automated breast ultrasound (ABUS) images to be co-registered, was demonstrated to potential customers. In fact, these two cases – acquired during our recent clinical trial at Groote Schuur Hospital – were the focus of an article that has just been submitted to an international journal for publication. In close proximity to CapeRay’s stand were four other firms from the Western Cape that were exhibiting innovative products. Medi-Safe Surgicals is a globally recognised manufacturer of surgical safety scalpels with a 15% share of this niche marklet in the USA. Wondermed makes a mobile workstation known as Woundhub that is used to treat wounds and, in particular, burns patients. BioTech Africa is focused on diagnostic solutions for infectious diseases and provides a range of purified recombinant proteins used in point-of-care rapid diagnostics. DISA Vascular concentrates on the treatment of coronary artery disease and manufactures cobalt chromium stents and balloon catheters. 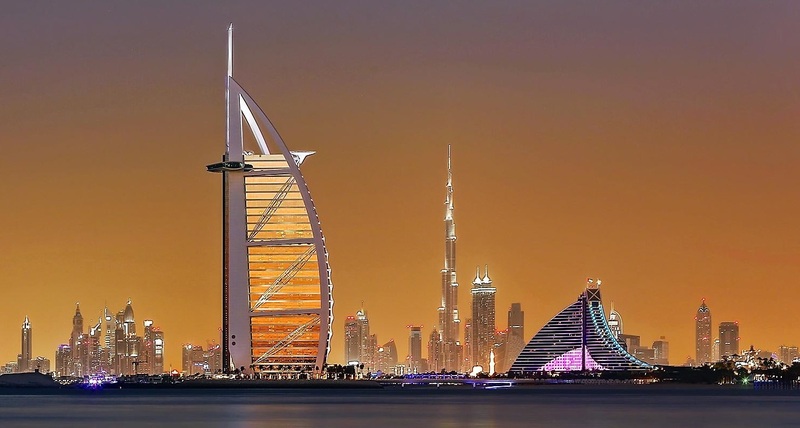 All the South African companies left Dubai feeling energized, with a network of connections and a raft of potential distributors to sign up. It seems certain that in twelve months’ time we’ll be saying “Hello Dubai” when we attend Arab Health 2018. Fantastic – totally impressive. You’re old dogs with no more tricks to learn. Go Caperay! Your product has candidate for Turkey Distributor. I hope will be everything very good future for you. Maybe i will not visit to Arab Health this year.